This is a simple, fun beading craft project that you can do with the younger kids, 4+. Be careful as it does use a piece of wire which is very pokey. An adult will be required to help the younger kids finish off the end as they may find it hard to make the bend to stop the beads falling off. Please read through all the instructions first before starting this craft, especially before you try take your children through this fun craft. Make sure you have all required items on hand. Using side cutters, cut a piece of wire about 20 cm long. 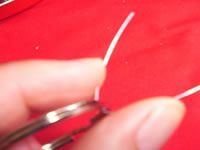 Thread it through the key ring and fold a short piece of wire about 5cm over. Twist the little piece of wire onto the longer piece, and secure it by twisting it around a few times. Thread the beads onto the wire. 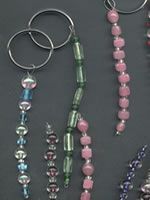 You can use any colour beads you may have. 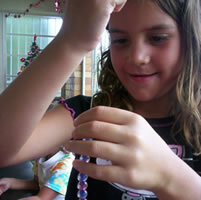 This is a great way to have some crafting fun with your children and recycle some old beads at the same time. When the beads have been threaded onto the wire and you have about 2cm of wire left, you need to turn up the bottom end. 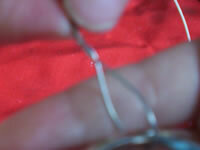 Use your pliers to twist the bottom of the wire back up again and thread it into the last bead. Your simple beaded keyring is now complete!